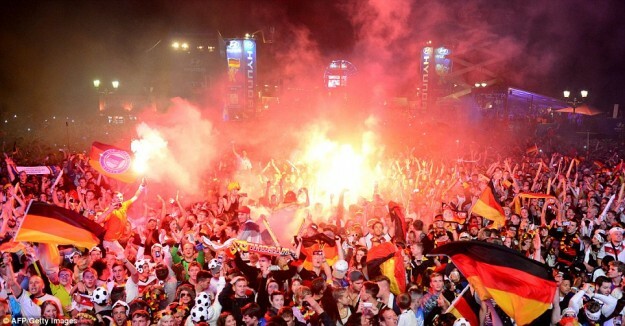 Millions of Germans took to the streets around the world last night to celebrate their team’s victory in the World Cup final. 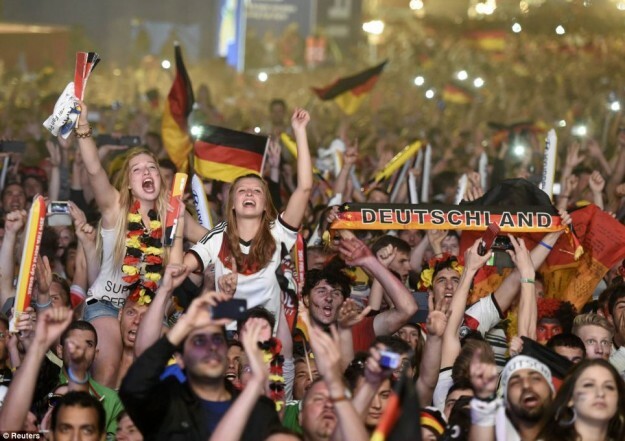 Ecstatic crowds sang and danced throughout the night following a dramatic last-gasp winner from young German hero Mario Götze, while tears flowed in Argentina after their stars - led by talisman Lionel Messi - failed to deliver. In the Maracana stadium in Rio de Janeiro, Angela Merkel - the German Chancellor - led the celebrations by hugging the players as they went up to receive their medals and the trophy. She later enjoyed a beer with Germany’s victorious manager Joachim Low in the team’s dressing room. Hero-of-the-hour Gotze celebrated with a kiss from his lingerie model girlfriend, while celebrities in the crowd included David Beckham - who brought sons Brooklyn, Romeo and Cruz., all wearing Argentina strips - and Rihanna, who celebrated Germany’s victory by flashing her bra and was later seen partying with the players themselves. Lead by WAGS, SWAGS, supermodels, and several half naked American singers in party-booty mode, a sudden influx of millions of drunk Germans overwhelmed the border crossing at Buenos Aires and caused an immediate surrender. Finding little of value worth stealing, most went home when the Jägermeister wore off. 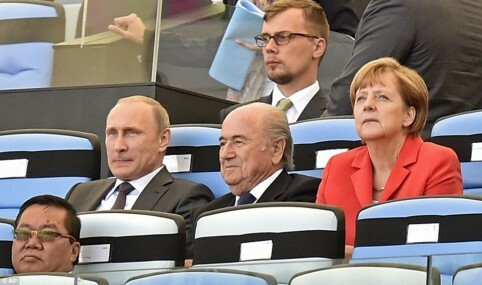 A stone faced Vladimir Putin made no comment. 3.2 gazillion pictures at this link.